In Part 1, the relative superiority of Half-Orc Great Axe Champion vs. Human Glaive Battlemaster was shown. A few facets were left unexplored regarding the conclusion and will be examined at end of this article as there is overlap with those concerns and our subject today: the optimal damage per turn fighter and its variants, as well as a few words on Superiority Die. To recall, the last two builds examined used a similar strategy of maxing attacks per round while tacking on to each hit a power attack of +10 damage in exchange for -5 to hit. Each of these relied on the Great Weapon Mastery feat to generate bonus attacks and power attacks. However, these builds are embarrassed by the combination of two other feats. Sharpshooter and Crossbow Expert should be taken with Archery fighting style for maximum damage and used in conjunction with a hand crossbow. One build is shown next, chosen for comparison to HGBM from previous article. Select Human, prioritize Dexterity in array. Take Crossbow Expert feat. Battle Master specialization, learn precision, evasive footwork, and parry. Upgrade Dexterity score to 18, gain +1 Dexterity mod. Bonus superiority die; learn 2 more maneuvers. Upgrade Dexterity score to 20, gain +1 Dexterity mod. Superiority dice grow to d10s, learn 2 more maneuvers. Bonus superiority die, learn 2 more maneuvers. Many customization options are available for this build, even for those with expected maximum level of roughly 15, popular in recent official adventure paths including Princes of Apocalypse. Since very little is gained past CL 11-12, multi-classing the last few levels is optimal. It can be noted here that HGBM also benefits from multi-classing but for many reasons DPT is scarcely impacted with these versus the proposed multi-classing for The Worst Best Build (TWBB). One may be tempted here to funnel the TWBB after CL 12 into Rogue’s Assassinate path for sneak attack damage. Some narrow utility may be found here, but this variant is nearly outperformed even in its assassinate round versus surprised targets by the preferred TWBB Ranger variant. In fact, the TWBB Ranger variant is the optimal build, last 3 levels taken as follows. The advantages are clearly seen with the additions of damage from Hunter’s Mark with every hit and Hunter’s Prey perks that apply every round, regardless of creature surprise. A +1 AC bonus is also gained via Ranger fighting style. These bonuses should be seen as preferred to continuing mono-Fighter to CL 15. Of course, any other suggestions to multi-class are welcome and should be left in comments, with the discussion of alternatives limited to those proposed. Now, let’s see how it all stacks up. TWBB is compared to HOGAC and HGBM in average DPT at CL 15 vs. AC in the figure below. The other builds are outpaced by TWBB Ranger Variant every step of the way. The reason can be easily understood when one considers that there is 100% uptime of the bonus attack with the hand crossbow, so at least as many attacks are made as other builds. More importantly, each attack is made at +2 to hit, so the damage from Sharpshooter bonus is applied about 10% more often. 1. Each attack is made at range, without disadvantage and ignoring cover. 2. Disadvantage is not imposed if adjacent to enemy. 3. Improved flexibility in feats and multi-classing seen with base build. 4. Improved survivability at range, bonus AC. 5. Relevant non-combat perks with Ranger. 6. High sustainable rate of damage. Another advantage of this build is found at the Race selection slot with some wiggle limited only by ending character creation with Dexterity of 16 from array. A favorite of this contributor that truly deserves name TWBB is to select a Stout Halfling Fighter, using a single hand crossbow with a large sack of bolts. The Halfling racial feature Lucky can be used to make a critical miss extremely unlikely at 1 in 400 rolls, contributing to steady DPT. Survivability is given by additional constitution buff, raising HP, with racial bonuses to frightened condition and poison in form of advantage. Last, movement through the space occupied by a creature larger than TWBB is allowed by racial bonuses, making TWBB very evasive and running or positioning easy. Interestingly enough, the only other change to above listed build is pushing the feat schedule up a slot, so that the Feat of Choice at CL 12 is used to maximize Dexterity score to 20, if desired. Yes, the Stout Halfling TWBB Ranger Variant is proposed as the most potent fighter. First, as promised, a brief discussion of Superiority Die (SD) will be made. An SD used for precision provides a great temporary boost for HGBM vs. HOGAC to DPT that increases based on AC. 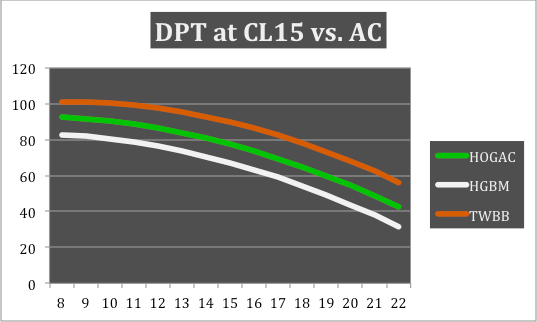 The effect can be demonstrated in examination of the figures tracing DPT at CL 15 vs. AC by identifying the target AC on the chart and subtracting 1d10 (average 5.5) from the AC for the new target AC, then a line can be traced up to the damage tracing of choice. This number can be compared against the DPT numbers at the original target to see the effect. The sizable effect represents using SD for every one of the 3 multi-attacks and the bonus attack. However, the limits are substantial. First, there are only 5 SD available per short rest to be used in this way. The effect above on average requires about 4 SD and the chance to miss still exists. In other words, this rate of DPT can only be sustained for a little over a round. Second, if the exercise above was done, it is seen that the damage increase with HGBM is small when compared to HOGAC and always less than TWBB. Third, if the SDs are used for precision, they cannot be used for anything else, say, surviving or buffing or commanding the rogue to sneak attack. So why are SDs chosen for use by TWBB? Stout Halfling TWBB Ranger Variant does not depend on SDs to deliver the most DPT with rock-solid survivability. But the tactical flexibility, synergy, and survivability that can be brought by them is worth more here than Champion Fighter’s perks, while TWBB has the flexibility to multi-class or feat as deemed appropriate. In conclusion, it has been shown that TWBB is superior, especially in its Stout Halfling Ranger Variant. It is strongly encouraged to put this information immediately into use and its benefits reaped broadly. Aspirational image is attached below to encourage the banishment of mediocrity. Note fresh new halfling face of fighter archetype. Note tiny crossbow and fancy appearance. 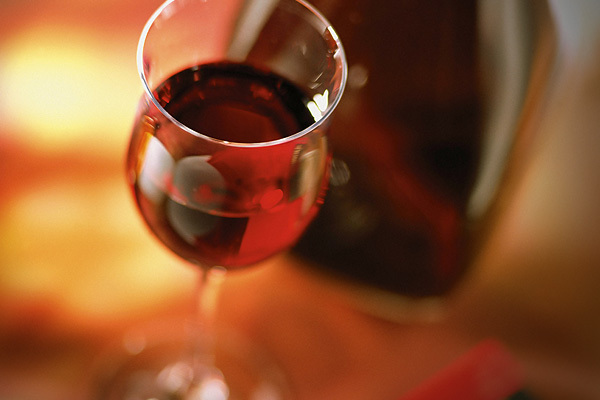 Note empty hand, the brandy-hand. See game changed. Shade will be thrown, but be encouraged. For hate will always be had by the haters.